A weak dollar (Fig. 1) to a point can help exports, but an extremely weak dollar which in combination with QE2 liquidity juicing up commodities even further, turns out to be a net negative on the economy, and risks sending the economy into another recession. 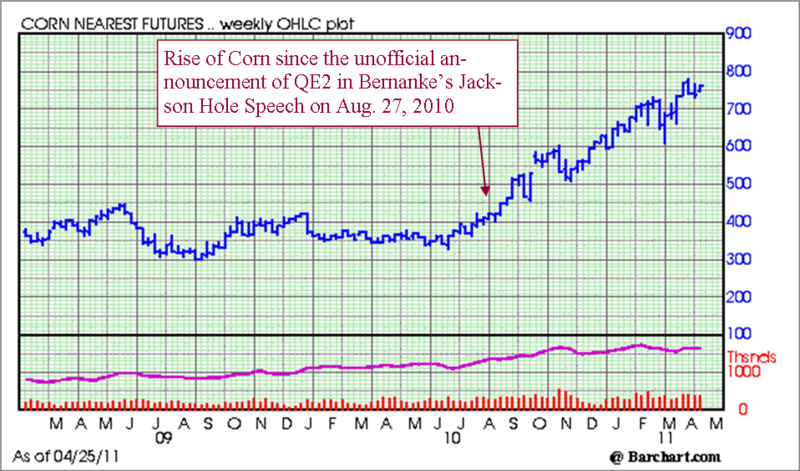 The reason for this is if businesses are having to eat higher input costs, and start to have lower margins, guess what? They start cutting costs again, and that means either stagnant employment practices or workforce cuts in the future. This would start sending the employment figures in the opposite direction, and negate much of the recent progress made over the last year. These higher commodity prices negatively affect consumers as well because they have to apply more of their income to food and energy needs, which means they have less discretionary income to spend for entertainment, retail shopping, vacations, traveling, and discretionary consumption which infuses the economy and creates jobs in the overall economy. And since the US is largely a consuming nation, if the consumer pulls back, then businesses are going to pull back as well. This linkage of events does not bode well for employment growth, and this shows how rising input costs not only hurt one of the fed`s mandates for price stability, but can also have a negative impact on their other mandate which is to increase employment. There is another angle we saw back in2008 with these same level of gas prices. Namely, consumers were feeling pinched by the jump in costs for food and energy (see charts below), so they started filling out credit card applications, and charging up their credit cards in order to pay for the additional costs to their weekly and monthly budgets for food and energy. In short, the higher costs for these items resulted in more debt for consumers. This means that the recent gains of consumers paying off their debts, and having more money to spend at retailers over the past year will start to reverse as consumers pay a higher percentage of their monthly budget in finance costs. The real damage starts to add up as consumers start to default on their credit cards as the high food and energy costs continue to be financed on credit cards until the consumer hits the breaking point, and just defaults. We saw a lot of this in 2008, and this is where we are heading again unless commodity prices start to come down in a rapid fashion. There are a large group of consumers whose monthly budget doesn`t allow for a 30% increase in gasoline prices at the pump, or a 10% rise in food costs at the grocery store. So they just pile up debt until they max out their credit cards. These increases in credit card defaults hurt businesses like banks and credit card firms as they have to write off more accounts, and thus their margins start to get squeezed. This means additional contractionary effects as they respond by cutting costs, and you can readily see how this starts to become a vicious deflationary cycle. This is why high commodity prices are actually deflationary in the long run. Something the fed should think about the next time they embark on a dollar weakening campaign, whether intended or not QE2 has been a dollar weakening campaign. And for those of you who still do not understand the chain of events, and how the Federal Reserve is responsible in large part for higher commodity prices here is the chain of events. The Fed encourages investors to take more risk: Go out of safe assets like bonds, and go into riskier assets like commodities and stocks. When traders take on more risk, they use more leverage-This means shorting the dollar, as part of the carry trade like a funding bank, to use these additional funds (leverage) to invest in risk assets like Gold, Silver, Oil and Dow Stocks. The trade starts to work, reinvest profits to buy more risk assets. Strong Trends emerge, attracting other traders looking to capitalize on trending markets. Dovish Fed talk serves to reinforce the trade further, dollar weakens more. OH NO! 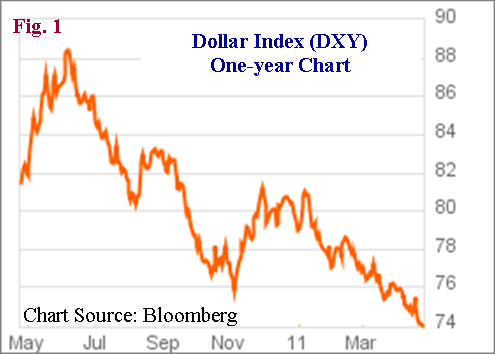 The US Dollar is falling apart, fear spreads: Investors really buy Commodities as an inflation hedge. Other countries like China start worrying about a falling US Dollar: They hedge by investing in Commodities. Lower GDP Growth Rate as a result of QE2 once the US Dollar reaches critical level where commodity prices rise to the breaking point where businesses and consumers pull back. QE2 Actually damaging the economy right now. 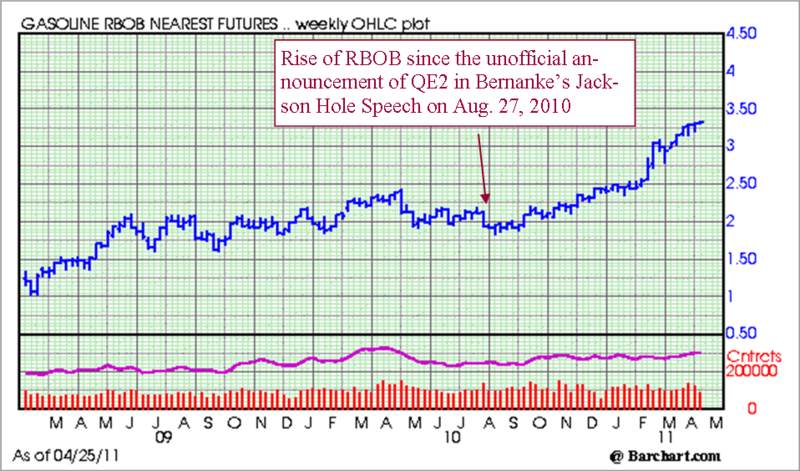 So you ask, and I am sure this is the Fed`s thinking on this matter. Well, what can just another two months of QE2 do to hurt the economy? It is almost over anyway. Let`s just continue it through to the end. Well, it is that very thinking that has investors and foreign governments concerned about the future and stability of the US Dollar. A lot of countries and investors rely on the dollar as a store of value for their assets because it has the Reserve Currency Status. It can be weak, but if global investors start to have legitimate doubts about the safety of their assets parked and backed by the US Dollar, then we have a much bigger problem than just a slow recovery. We could end up in a currency crisis that takes down the entire global economy, thus sending us right back to where we were in the depths of the financial crisis. But that is more macro analysis, and things would really have to spiral out of control to get to that stage, but it is possible, and that is why people are worried enough to buy physical Silver at $50 an ounce when it very well could be worth less than $20 an ounce once the rate tightening cycle begins. It makes no rational investing sense to buy Physical Silver during a low rate environment, because the investor will be stuck with a well under water investment in a 5% rate environment, unless there are legitimate concerns about the long term stability and security of the currency. The time to buy Physical Silver was when the Fed Funds Rate was 5.25%, and the time to sell Physical Silver is now during the last vestiges of an equivalent Zero Fed Funds Rate. This irrational investing in the Silver Market, based upon concerns regarding the long term stability and security of the US Dollar, is one of the unintended consequences of the QE2 Initiative, and from a macro standpoint should raise a few eyebrows within the Federal Reserve. The Federal Reserve should weigh not just the Micro benefits to a policy initiative, but also the macro effects as well. Furthermore, there are many unintended consequences and macro concerns created by the QE2 Initiative that merit careful study to avoid some of these same mistakes being repeated in the future by monetary policy initiatives. However, the more practical concern for the Fed is this–If they leave QE2 to finish out on course, and attach some dovish language to boot, investors will add another 50 cents to the price of gasoline at the pump, food prices will go up another 3 to 4%. After all, they have to pass on higher transportation costs to consumers. Businesses can expect higher commodity input costs for the next two months. The US Dollar will get even weaker, and GDP will be affected even more, as two additional months of damage will be pushing through the US Economy and Supply Chains. So this could result in the third quarter GDP be even more significantly revised down by economists. This is all to be juxtaposed with the alternative of ending QE2 early, which would lead to the US Dollar strengthening, and send a strong message to speculators, driving them out of commodities, and immediately reducing input costs for businesses and consumers. This cycle becomes reinforcing which leads to a further lowering in commodity prices as funds flow out of this asset class, thus providing an instant and even greater stimulus for the economy. In essence, the ending of QE2 this month, serves to jumpstart GDP Growth for the remaining two months of the 2nd quarter, which will then build some momentum going into the third quarter, and should boost 3rd quarter GDP growth, and set the stage for a robust 4th quarter GDP number. The momentum is the key; you either have an accelerating economy or a decelerating economy. And right now due to the effects of QE2 we are starting to decelerate, and another two months of deceleration makes it twice as hard to restart the acceleration process. So two months could make a huge difference in either creating or destroying momentum, and setting the growth rate pace for the remainder of 2011. The choice is obvious when asking the question regarding would the economy be better off without QE2 for the next two months? It is a resounding yes! Why this is even an issue at this stage seems more to do with the Federal Reserve saving face, than based upon any sound economic analysis of the facts at hand. If President Obama wants to address the speculators for raising gasoline prices for consumers, he might want to investigate the real culprit in QE2. The easiest way to give consumers a break at the gas pump would be to end QE2 this month. The price of Oil, priced in Dollars, would drop like a rock as the US Dollar strengthens if QE2 is suddenly stopped, and Gasoline prices also trading opposite a weak dollar would start dropping immediately at the pump as the US Dollar strengthens. In summation, if President Obama wants cheaper gas prices for consumers over the next two months, then all he has to do is make a call over to the Federal Reserve. I hear they are having a meeting this week and are deliberating over the future of QE2. Source: Dian Chu, EconMatters, April 25, 2011.